After a prolonged standoff between Church and Committee forces in Red Throne, the blast of Church cannons marked the beginning of civil war in Sirdovia. Reports indicate that Soviet and Church forces are clashing in all major western cities in Sirdovia. While the Church claims control over the situation, the Military-Revolutionary Committee claims that the People will follow their soviets. Neither side has claimed military conquest of any western city. The largely rural east, including Sancutary and Sirvania, appears unshaken. There has been no unrest or military action. Though soviets have formed in the eastern cities, they have not allied themselves with the Military-Revolutionary Committee. The bulk of the forces commanded by the Military-Revolutionary Committee consists of 40,000 soldiers who have defected to the revolutionary cause, with the support of 25,000 militia forces. Asagonese weapons and dinosaurs have been smuggled into revolutionary hands. Loyalist forces are smaller in number, but include some 15,000 Braddian forces, 5,000 elite paladins and 20,000 People's Crusaders, the Church's militia force. The 24 ships of the Imperial Navy are also in support of the Church. The clash in Red Throne began at roughly noon today, and lasted several hours. The focal point of the battle was in the large slum district, a stronghold of Committee support. The Church forces made ground quickly, surging into the densly-packed, narrow streets of the slums. The forces spread out, but soon faced great resistance in the form of street blockades and ambushes. The Church forces had to form up and move as one group. The bulk was soon surrounded by Committee forces, and forced to surrender north, out of the slums. The Committee has called this the first of many victories. The battle was decisive, though several hundred men are suspected dead, with hundreds of others wounded. Reports from other cities report much the same, though details are not yet at hand. In one day, the entire nation has divided itself, and neighbour has fought neighbour in the bloodiest conflict in Sirdovia since the extermination of the Hurngat'rr tribes in the far west, almost a year ago. Let us hope that the war is ended soon, that the nation does not tear itself apart and drown in its own blood. The Magnificent Descent decorations have still not been completed. Neighbors and allies it is of the greatest importance that we now all send troops to the Sirdovian front to recreate stability in a nation that is close the the eldar threat and could react soon. with the Sirdovians not at our sides the fight might even be over before it began lets all unite in this fight and lets make peace in Sirdovia until the Eldar threat is gone! We advocate the seperation of Sirdovia into two nations. One for the church of the Red Hand, and the other for the Soviet Revolutionaries. And perhaps a third for all others. Reports from the Abagozen Purification Zone indicate a CHurch victory against revolutionary forces. It is reported that after a brief battle in the city of Redemption, soviet leaders were captured. Soldiers and militia are being held in the facilities that held the Saurian population during the Great Realm War. The leaders of the uprising were taken out to the Western Passage by boat and thrown overboard. It is assumed that none survived. Across the Western Passage, the city of Stormguard, on the southern coast of Scondovia, has also been captured by Church forces. The revolutionaries had captured the Church headquarters of the city, and had successfully repelled all attacks upon their position. The Committee lost control of the city, however, as the Imperial Navy began shelling the city. All known soviet positions, including the Church headquarters, were levelled. As revolutionaries emerged from the rublle, it was clear that most had been killed by the three-day bombardment. Rumour indicates that surrendering revolutionaries were lined up and executed by Imperial Marines. The Church is calling these victories the first of many, claiming that "the faithful, by His Grace, shall prevail against the heretic." In Red Throne, the fighting has intensified, with the current battle-line cutting between the slum district in the south, controlled by the revolutionaries, and the rich north, controlled by the Church. Both sides have dug in, and the line seems unlikely to shift, with both sides firmly holding their positions. Eastern Sirdovia has still experienced no conflict, and thus remains within Church control. The Braddian King has send a golden apple to the Sirdovian church as a sign of great happieness for the victories they just had. The Braddian King sugests that these rebbels will be either be killed to used as slave labour. The battle of High Watch has been won by the Soviet forces. Militia and soldiers formed a massive force and moved as one entity, systematically overrunning the scattered Church forces, who overextended themselves by trying to hold every chokepoint. The Church forces were eventually driven to the coast, where they surrendered. While there were many calls for blood, no executions were held, with all enemy forces imprisoned in the city jail and several makeshift prison camps. Soviet forces are now preparing for a naval attack from the Church against the city, not wanting to repeat the utter rout of Stormguard. Imperial Navy ships have been seen moving north up the coast. Saint's Reach was also taken by the Military-Revolutionary Committee, after having been forced out of the city. Church forces chased the rebels into the mountains in one large force. The decorated Colonel Figrin, who was one of the first high-ranking officers to defect to the Soviets, ambushed the Church force. The daring Colonel triggered a rockslide that hit the Church forces directly, wiping a significant number out. Rebels then emerged from concealed positions, surrounding the Church forces. Most officers were executed, and the common troops were detained, pending re-education. In another massive blow to the Church, the first activity in the east has been against them. The city of Dravin, the historic capital of the Serinian Empire, the original land of the Scondovian people, has declared independence. The new nation has not aligned itself with either of the sides in the war, and has claimed that it is taking an isolationist stance in the conflict. The nation, calling itself the Great Serinian Republic, was taken in a bloodless coup by a local fascist organisation. The republic claims that its aim is to restore the former glory of the Serinian Empire. The official line is that neither religion nor class war are stable or wise foundations for a strong, independent nation. The new government, despite their controversial political views, are enjoying widespread support in the city-state. In any case, they appear to be preparing for a defensive war to fend off any would-be attackers, and known clergy and leftist agitators are being arrested. The local army units have sided with the government, giving the nation roughly 6000 soldiers. Church forces have finished securing and purging Stormguard, and are now advancing straight toward Red Throne, appearing to bypass Adinia and New Dravin. Imperial Navy ships are moving up the Scondovian west coast, presumably for an attack on High Watch. Adineas the Red wrote: The battle of High Watch has been won by the Soviet forces. Militia and soldiers formed a massive force and moved as one entity, systematically overrunning the scattered Church forces, who overextended themselves by trying to hold every chokepoint. The Church forces were eventually driven to the coast, where they surrendered. While there were many calls for blood, no executions were held, with all enemy forces imprisoned in the city jail and several makeshift prison camps. Soviet forces are now preparing for a naval attack from the Church against the city, not wanting to repeat the utter rout of Stormguard. Imperial Navy ships have been seen moving north up the coast. Braddian forces (13.000 strong having lost 2000 in the former battles) are send to the new independent nation to reensure Sirdovian power in this province. The March wil be halted if the Sirdovians dont want this attack. Braddian troops have attacked Dravin, a vicious battle commenced. 14.000 Braddian soldiers met with the 6.000 men of militia of the nation, 4.000 Braddian Dragoons ride into teh big army, first shooting and then using a cavalry charge. many fall but many bullets miss due to the terain and the fast riding making it hard to aim,the cavalry charge makes a big impact. 2.000 Braddians die in this charge, 2.000 flee as fast as they can having slain 2.000 men due to their advanges of terain. Now the Army of 10.000 walking Dragoons run to the battle field, they form line and shoot. But the militia is not fooled and shoots back, hitting 1.000 men. But the outnumbering Braddian numbers succeed in killing the 3.000 left men. Braddian losses are big at the end: 3.000 died and 1.000 wounded. but the brave militia of the enemies have been slaughtered by their advantedge of terain and knoledge of the nation's grouds and well armmend gave them a good ressistence to the lightly armed Braddian who where foolish thinking of easy victory. Braddians will march soon on words to the Capital City. but will rest for now and will march with 8.000 men to the city, fully armed. High Watch has been retaken by Church forces. Rebel forces had been expecting a land-based counter-offensive from the south, and had stationed most of their forces there. The Imperial Navy proceeded up the coast and shelled the city into submission. The encircled Committee forces surrendered, and are being held in High Watch, pending execution. Sirvania City has declared its full support for the Military-Revolutionary Committee, lending its garrison and supplies to the revolution. 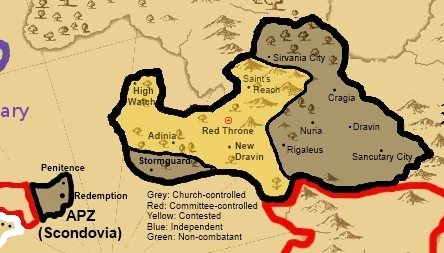 Sirvania is the strongest agricultural region of the fractured Sirdovia, and its liberation constitutes a great long-term loss for the Church. The Dravin Uprising has been crushed by the Braddian forces. On the way back toward the capital, Nuria surrendered to the Braddian forces. Despite the success of the Braddians, the quelling of the Dravin Uprising has outraged the nearby cities of Cragia, Rigaleus and Sanctuary City. Riots and street fights against Church rule are raging in those cities. The Military-Revolutionary Committee has sent 3000 troops to Cragia to assist the revolutionaries there. Despite the eastern regions spiralling out of control, the Divine Church of the Crimson Hand has pledged that "the Holy City shall be taken at any and all cost. To turn our back on His Holy City would be blasphemy. Red Throne must stand as a testament to the faith of the pious, a shining beacon of hope for all Mankind." 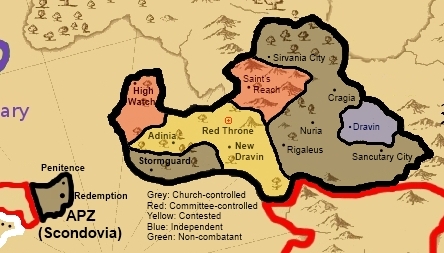 Almost all Church forces are directed at Red Throne, leaving most of the rest of the shattered nation in chaos or revolution. The Military-Revolutionary Committee has taken this statement as evidence of delusion and pride. "The Church, in its irrational zeal for their false god, focuses all of its attention on its so-called "holy city". This is our chance, comrades! We must stage one massive push! Tear out the fangs of this beast with simultaneous revolutions in each city! At the same time, comrades in the streets of Red Throne must push on to cut the head off this snake. A headless beast quickly withers and dies. Push on, comrades! Push on, and win the day for liberty, justice and democracy! Death to tyranny! Long live the revolution!" Damn, well dont worry, we shall aid you till the last men! Adinia has been captured in an assault from the north, launched from the fleet at High Watch. The Marines took the defenders by surprise and seized strategic points in the city quickly. Few casualties were sustained by each force, and the defenders surrendered, with nowhere to run. The Church now controls most of Scondovia. Cragia has been captured by the rebels, aided by 3000 Committee troops from the north. 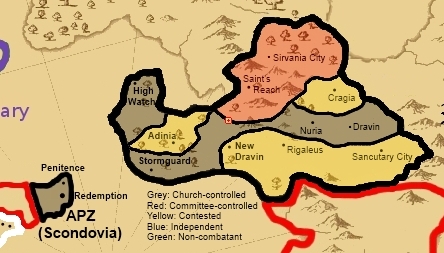 In light of this event, the Military-Revolutionary Committee has established the Sirdovian Soviet Federation, comprised of Saint's Reach, Sirvania City and Cragia. To the south, rioters in New Dravin, Rigaleus and Sanctuary City have defeated Church troops occupying the cities. The cities have formed a union called the Palurin Confederacy. Elections for a new government are to be held immediately. There is a great nationalist ideal in the Confederacy, seemingly inspired by the Dravin Uprising. The Confederacy was formed in part as a response to widespread public opposition to the war. The historic Sirdovia-Palurin Non-Aggression Pact was signed by representatives from the Sirdovian Soviet Federation and the Palurin Confederacy in Cragia today. Among the signatures were those of heads of state President Cromler and Premier Coleman. The treaty indicates a mutual concern over the danger of a reinvigorated Congregation, and the vast numbers of new recruits it has been able to call upon since the appearance of the Red Messiah, and the difficulty of fighting a war on two (or in the Confederacy's case, three) fronts. 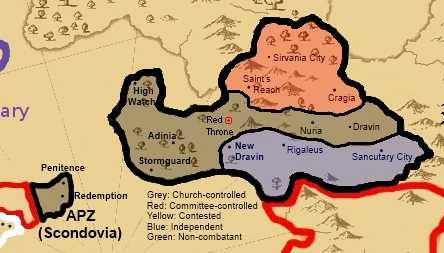 I think that there should be a three way treaty: Sirdovia gets Scondovia, Palurin Confederacy gets Sanctuary, and the Communists get Sirvania. The Premier has authorized one thousand Asagonese troops to be sent into Sirdovia to aid the Soviets, they hope to reach the Comittee though the Palurin Confederacy. The Asagonese have reached out to Palurin via several diplomats proposing mutual trade and military access through the continent. PRA wrote: The Premier has authorized one thousand Asagonese troops to be sent into Sirdovia to aid the Soviets, they hope to reach the Comittee though the Palurin Confederacy. The Asagonese have reached out to Palurin via several diplomats proposing mutual trade and military access through the continent. The Confederacy accept the propsals. The Asagonese forces are permitted free movement through the Palurin Confederacy. May both our nations grow strong and prosperous. Braddia will send its reserve army of 10.000 Line Infantry to Sirdovia to stop Soviet advancement and to counter the Asagonese war effort in Sirdovia. Once again, the Braddian Crown shows its commitment to peace, security and the honour of His Glorious Name. His Most Holy Congregation sends its blessings to the Crown. Once again, Braddia, the Congregation's lap-dog, bows before the fraudulent tyrant's whims. The imperialist powers will go to any lengths to ensure that their hegemony is not threatened. This move is surely a sign that the imperialists are worried. They have underestimated the resolve of the People! The oppressors claim that they are secure, yet they slaughter their own people out of fear that they will revolt! They claim strength, yet rely on their allies to defend them! They claim divinity, yet their so-called god refuses to even show his face! It is time to destroy the Congregation for good. At last, the People of this land shall be liberated! Asagon will be by your side, we fight for the people of SIRDOVIA! ORA! The braddians shall never let its allies fall, our might shall be seen! OOC: My guys are already at Palurin, whose gonna make the battle thread? PRA wrote: OOC: My guys are already at Palurin, whose gonna make the battle thread? Are they there to attack Palurin, or support the Soviet Federation?